I had my first OBGYN appointment on Wednesday Dec 4th. That is the most annoying part of finding out you’re pregnant: the waiting! It was the soonest they could get me in with Stacy so I took the appointment even though it was at 10:40 and I have to pick Kye up at school at noon. My lies continued as I told Mrs. Charlotte I had a foot appointment so she could keep Britt. I knew the first appointment included lab work and there is no way I could handle her and not freak out about the labs. Since the appointment was so late I got there really early…they told me if I got there early I could hopefully get in early so I did it! Prior to my appointment the office called to go over ALL of my medical history with me. They asked about my prior deliveries and said my notes said I HAD DRUGS in my IV. Um no. I got crunk about it and told them I better not have had drugs in my iv or there was gonna be a lawsuit! She put me on hold and did further research on my charts and came back and said that whoever did the report she had been reading just checked “yes” to drugs probably b/c everyone usually gets them but that my records don’t show any were administered. Whew 😉 I knew they didn’t give me any b/c I got the itemized bills at the hospital and I wasn’t charged for any but still I was a little nervous!!! While I didn’t have long Stacy and I covered quite a few things at the appointment! I asked her about the whooping cough vaccine. I had it when I delivered Britt but I’ve read SO MUCH scary stuff and wanted her take on if I needed it again. She said not only do I need it again (during second trimester) but EVERYONE who plans to come in contact with our baby HAS TO HAVE IT. They actually had a little baby die who had been delivered by their office. So sweet friends and family: GET THE SHOT!!! I brought ALLLLL my Advocare stuff with me for her to look at. I totally looked like a junkie with all these pill bottles in my purse haha! Here’s what she said about each thing (I plan to do a post on what Advocare stuff I’m taking eventually! ): The meal replacement shakes are AMAZING. She was blown away by them and said it will help me to continue not to have morning sickness by drinking one each morning like I’ve been doing. She said the protein in them is awesome! She said the same thing about the Spark and Rehydrate combo I drink each afternoon. When she was reading the back of them she said “you are pouring so many great vitamins into your baby!! !” The omegas looked great and she said taking four a day was fine. She also said the coreplex with iron was fine for my prenatals but to add 400 mg of folic acid just to make sure I get enough each day (I found a big bottle of it at Publix). She did tell me to hold off on the probiotic restore until the second trimester only because she didn’t recognize some of the stuff in it and that I probably would be better off not taking the catalyst at all since it doesn’t really offer any benefits to the baby and some of the ingredients were also a little strange sounding to her. She did say the calcium plus was great to continue taking as well! Overall I felt GREAT about using Advocare while pregnant!!! She checked me and said everything felt perfect and right on time! My blood pressure was good and my weight was MUCH higher than my home scale (I had boots and a jacket on and didn’t bother taking them off b/c WHO CARES haha). We discussed my aches and pains and she said that it’s normal to have a LOT more of that this time around. And that I’ll also show quicker! Both the back pain and the feeling the uterus expanded were normal things for a third pregnancy at this point and basically my body just knows what is going to happen so it just goes ahead and gets in baby mode quickly. For the back pain she said the heating pad is fine for 20 min at a time. She told me I should be aiming to get on the elliptical 2-3 times a week for 20 min each time but that at this stage rest really is the most important thing! My second OBGYN appointment was on Friday December 20th. For an ultrasound!!! Yay! Since I didn’t have one with Britt until like 18 weeks, I was SO excited! I was very, very sick that day and was eager to see my baby and make sure everything was okay. Casey and Jordan had an appointment Friday morning as well so they took the kids for us after they got done with their visit so we could see the baby just the two of us! Since I am so early they had to do an internal ultrasound, which I’ve never had before. The wand they use is MEGA intimidating but it wasn’t painful at all! The lady who did the ultrasound was very, very nice and lives in our neighborhood (I was MEGA out of it and totally didn’t realize I’ve even been to her house before for a game night haha). Up until that point it all wasn’t feeling very real to me yet. I either didn’t feel like I was pregnant (like to the point of being in denial about it and having to leave the positive pregnancy test out on the bathroom counter so I could look at it all the time to remind myself) or I felt like something was wrong with the baby (that devil will try to steal joy!!!). Seeing the baby pop up on the screen didn’t give me that ah-ha moment. 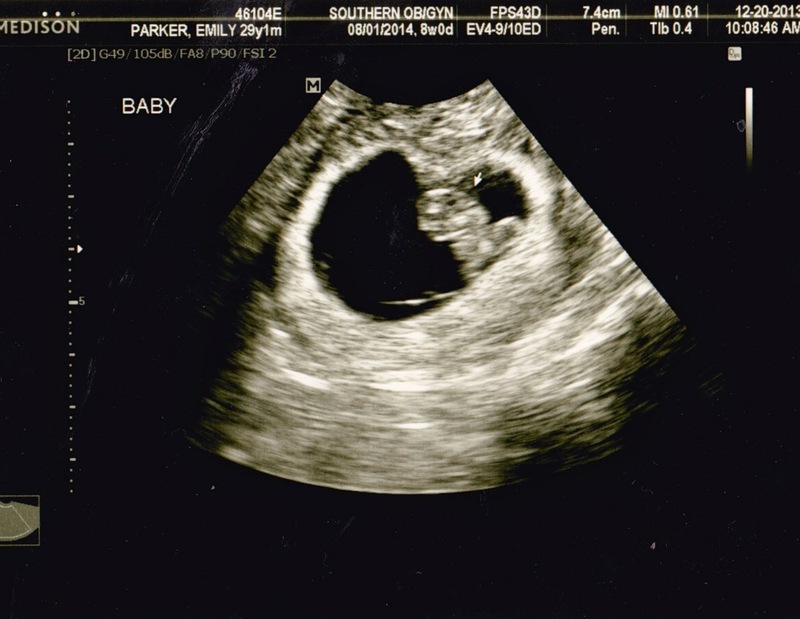 I mean it’s a little blob right now 😉 But when we could see it’s little heart pumping and hear it…it became REAL. I told Zach “It’s gettin’ real now!” And I meant it! It was so, so, so, amazing and awesome and perfect. The baby is on its side so it’s a profile view. If it had been a front view she said we would have been able to see limbs! Dangit! I wish we could have seen that but I’m just happy to see what we got to see!!! The black hole is actually the brain! It’s so neat to me how this early on there isn’t even an umbilical cord yet. Our little baby is just floating around in there hanging out 😉 The heartbeat was 167 which is so strong and made me feel teary eyed and I was measuring exactly correct on my due date of August 1st! With all my early strong symptoms I had actually done some “signs of twins” googling haha. Usually Zach is the one who questions whether it’s one or two but this time I was the one questioning it! He is pretty overwhelmed at the thought of having three kids and couldn’t even begin to wrap his head around the idea of four right away! Thankfully, it’s just the one baby 🙂 No twins for us!!! Once we got back to a room Stacy walked in and said “ultrasound looks perfect!” right away which made me SO happy. After having that fever and the spotting issues it felt SO amazing to hear that our baby is perfect!!! We didn’t have many questions and it was a quick appointment. But I did ask again about my back since it’s really bothering me and Zach had suggested epsom salt baths. Stacy said it’s worth a try! Also in my state of sickness misery I noticed a LOT of discharge “down there.” TMI but my junk has it’s own weather system normally anyways. Pretty much every time I get an OB check they do cultures to see if I have a bacteria infection b/c there is so much going on downstairs. This discharge though was a lot. Like I was standing up naked in my bathroom and a gush came down my leg (gross, I know, trust me I lived it!). I was concerned it could be amniotic fluid or something??? So she went ahead and checked me and ran labs on it to check everything out. She said no call was good news and I never heard from her so I guess it was fine! Now that I’m doing better with my sickness all that mess has calmed down too so it was probably a reaction to antibiotic or something! I don’t go back until Jan 17th and I don’t think I get to see the baby again until 18 weeks but I will just be happy to hear that heartbeat again. Best sound ever!!! Seeing our sweet baby made it even more exciting to get to tell the family Christmas morning and made me more confident about announcing our news to the world!!! Next Post My (first) 29th Birthday! Hemoglobin is your red blood cell count. They want to make sure you're not anemic, i'm guessing (low iron).Love the ultrasound!!! I had a TOOOOON more aches and pains with Cooper – but he was also a huge baby (but my 3rd pregnancy). So who knows why? But I remember vividly that I had that problem all the way through.I love seeing the early ultrasounds of Leo! It makes it so much more exciting! I had to laugh a little about the internal ultrasound. I've literally had like 50 or more of those, but I still remember seeing that wand the very first time :-). It can be a little intimidating!